Get ready for the annual Perseid meteor shower. This year the peak of activity will be from midnight, August 12th to dawn, August 13th. The Moon, unfortunately, will be full. But if the sky is clear, and you get up around 3 am, you’ll have about a two hour window with the Moon low in the west. It’ll start getting light around 5 am. Of course, even the Full Moon won’t obscure a really bright fireball. And you never know what to expect with a meteor shower. Watch for most of the action in the northeast to overhead. The Perseid meteors all come from a cloud of debris left behind by comet Swift-Tuttle. 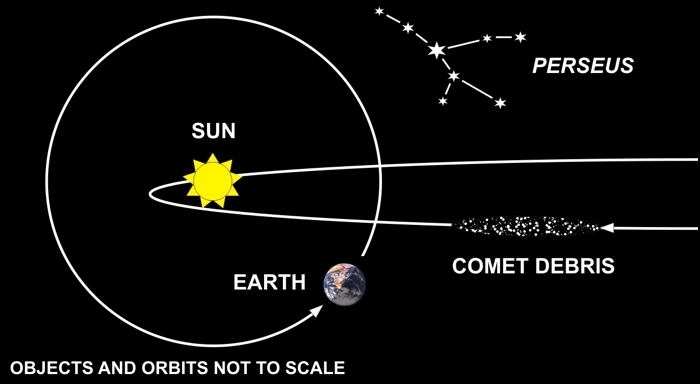 This debris orbits the Sun, as does the Earth, but it’s orbit is elongated and tilted in a different plane. The debris is spread out along the whole orbit, similar to Saturn’s rings, but there are places where it tends to clump up more. When Earth hits one of these clumps the rate of activity can exceed a meteor-per-minute. Every August Earth passes through this belt of debris and, like when you drive a car into rain or snow, it all seems to be coming straight at you from directly ahead. With meteor showers, that point is called the radiant. The faint constellation Perseus is located in that direction, hence the name Perseid. So get out your lawn chair, grab a cold one, and find a dark location with a clear view of the sky. Then settle in for the night, and prepare for one of Nature’s greatest fireworks displays.